This is a review of Nutrition 21’s Botanic Vitamins for Hair. This manufacturer claims this product will naturally help to grow hair and by using protective nutrients in the product the hair will become more pliable and manageable. It also claims to battle the signs of aging in the hair. Keep reading to find out more about Botanic Vitamins for Hair’s guarantees, prices, ingredients, and possible side effects to help you decide if this is the right product for you. These main ingredients combine to provide protein-rich nutrients which have been known to help with healthy hair growth. Lobster, crab, and shrimp are also ingredients in this product, so people with allergies to shellfish should not take Botanic Vitamins for Hair. The manufacturer recommends taking two tablets each day for best results. As with many supplements it is recommended to eat before taking this product. Due to the variety of ingredients there are many side effects possible, though rare. Some of these are nausea, rash, headache, blurred vision, feelings of weakness, diarrhea, gray stools, sever stomach pain, vivid dreaming, pounding or irregular heartbeat, spasms in the lung muscles, weight gain, and psychotic behavior. If taking this product and you experience any of these effects, or any others, seek help from a physician promptly. 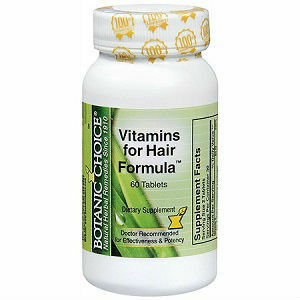 The normal price for Botanic Vitamins for Hair is $22.99. At times the product goes on sale for $10.00. Keep in mind shipping is extra unless you make a purchase of more than $25.00, then shipping is free. Another way to get and keep a discounted price is to sign up for Auto-Refill. You’ll need to pay with a credit card, Pay Pal is not acceptable as a choice. By choosing Auto-Refill you will not only get this product for the sale price but you will save 50% on shipping costs which brings shipping down from $5.95 to $2.95. Another advantage of using this service is that you control when they send you more of the product, and there are no membership fees or extra charges of any kind. If not 100% satisfied and as long as the product is still within the expiration date, you can return the unused portion to the manufacturer for a 100% refund, no matter the reason, no questions asked. Nutrition 21’s Botanic Vitamins for Hair promises to grow healthy hair. After researching consumer reviews no complaints were found. The manufacturer claims to use only ingredients of superior quality from leading suppliers to ensure this product is full of the best nutrients possible. If purchased at the sale price of $10.00 plus shipping costs, this is an inexpensive choice in hair health. Results may not show until you have taken this product for several months. Since this product contains shellfish it is not a product for those with an allergy to shellfish products. John Brownstone	reviewed Nutrition 21 Botanic Choice Vitamins for Hair	on August 3rd	 and gave it a rating of 3.5.